Vinpocetine, derived from the periwinkle plant, is another powerful memory enhancer. It improves blood flow to the brain and improves the brain's use of oxygen. It also helps with concentration. Buy 1 for $16.75Buy 2 / Save $0.89!Buy 3 / Save $3.35! There are two classes of active compounds in periwinkle-alkaloids and tannins. The major alkaloid is known as vincamine. A closely related semisynthetic derivative of vincamine most widely used for health is known as ethyl-apovincaminate or vinpocetine. It has vasodilating, blood thinning, and memory-enhancing actions. It has been shown in double-blind studies to help alleviate a type of dementia known as vascular dementia, in which the arteries supplying blood to the brain develop atherosclerotic plaques. A double-blind study found that vincamine can help people with Memory Loss. Vinpocetine has also been found to help avoid the decline in short-term memory induced by the anti-anxiety benzodiazepine drug flunitrazepam in one preliminary study. Gingko biloba, which has been used in Eastern cultures for thousands of years, is perhaps the most well-known and one of the most potent "memory herbs." It works by increasing the blood flow to the brain, by dilating the blood vessels and increasing oxygen supply. However, it isn't an instant solution as it can take a few weeks to start seeing results. It also gets rid of free radicals that can damage brain cells. You don't have to be middle-aged or older for ginkgo to help increase brainpower! Recently, there has been much speculation that ginkgo may act as a "smart nutrient," improving intelligence in healthy, young people. At the Swinburne University of Technology in Melbourne, Australia, 60 students participated in a 30-day double-blind, placebo-controlled clinical trial, in which they were given a battery of neuropsychological tests before and after taking ginkgo. Results indicated that the students who took the ginkgo, showed a significant improvement in the speed at which they processed information and retained it. In another placebo-controlled, double-blind study at the Division of Psychology, University of Northumbria, Newcastle upon Tyne, UK, 20 students were given a cognitive assessment on which they were tested for attention, accuracy, speed of memory and quality of memory. They received 120 mg, 240 mg and 360 mg of a standardized extract of ginkgo or a placebo over a six-hour time period. The results showed that the students who received 240 mg and 360 mg of ginkgo biloba extract had a sustained improvement in attention, even six hours after they had received the supplement. No matter what your age, Ginkgo Biloba helps to sharpen your mental performance, increase your concentration and short-term memory, boost your energy levels and slow down the aging process. In a recent study, subjects who took sage performed significantly better than those who didn't on a word recall test. Although the exact mechanism behind this isn't fully clear, experts believe sage might increase levels of a chemical that helps transmit messages in the brain. Since this is also the same chemical that is lacking in those suffering from brain function issues, the possible use of sage to help support this is being examined. In a double-blind study of people with memory loss, supplementing with sage for four months resulted in a significant improvement in cognitive function, compared with a placebo. Although it is not known for sure how sage improves cognitive function, it appears to have an effect on acetylcholine, one of the chemical messengers (neurotransmitters) in the brain. I am on a blood thinner so what is the effect would it have one me. Ginkgo biloba may enhance the blood-thinning effects of medications like warfarin due to the fact that ginkgo improves capillary circulation. It may be necessary for your healthcare provider to make a dosage adjustment prior to use, or it may be recommended that you don't use this product concurrently with prescription blood thinners. As far as sage and periwinkle go, there doesn't seem to be any documented drug interactions. Upon perusing the ingredients of the above product, all I saw was Periwinkle, 10mg. No other products were listed. What happened to Ginkgo and Sage? Thank you. 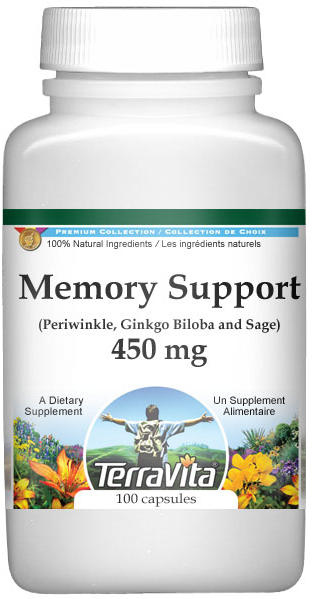 I do apologize that the remainder of the ingredients were not listed on the product page at the time you viewed it, however, I can assure you that the full list of ingredients for Memory Support capsules is now present! This product does include 10mg of periwinkle, as you mentioned, as well as 220mg of each ginkgo biloba and sage. I do hope that this has been of some further help! Coumadin, also referred to as Warfarin, is an anticoagulant (slows blood clotting) used to relieve people with venous thrombosis (blood clots in the veins) and pulmonary embolism (blood clots in the lungs). Coumadin is also used to relieve dangerous blood clotting in people with arterial fibrillation (an irregularity in heartbeat) and, in some cases, to prevent stroke. While there are no adverse drug interactions between Coumadin and periwinkle and sage, it is not recommended that you take Ginkgo Biloba while on this prescription medication without first speaking with your physician. He or she will have the most knowledge regarding your personal medical history and will be able to make the best decision regarding your optimal health. Any side effects? Particularly concerned about blood pressure. In the studies you reported was the BP checked? There doesn't seem to be statistics available for the blood pressure of the test subjects in the studies mentioned, but I have tracked down some related information. Where ginkgo is concerned, caution is advised for patients with diabetes or hypoglycemia as it may influence insulin and blood sugar levels. Therefore, serum glucose levels should be monitored very carefully if ginkgo supplements are taken in conjunction with diabetes medications. Based on laboratory and human studies, the Mayo Clinic web site states that ginkgo supplementation may lower blood pressure, although there is one report where ginkgo raised the blood pressure of a person taking thiazide, a diuretic water pill. However, this particular hypertensive interaction has not been verified by clinical trials and, in fact, high blood pressure is often cited as one of the indications listed for which ginkgo biloba is prescribed. It is widely believed that the promotion of vasodilation and blood flow is responsible for the anti-hypertensive effects of ginkgo biloba. I'm not sure if your concern is higher or lower blood pressure, but it appears that ginkgo has a confirmed hypotensive (blood pressure-lowering) effect on the body. Make sure you consult a qualified healthcare provider before you take any herbal supplements to ensure that any adverse drug interactions may be avoided, and dosages can be carefully adjusted and monitored. While sage leaf seems to be less of a concern, periwinkle also may exhibit a hypotensive effect, so similar precautions should be taken. Those already on medication for lowering blood pressure may run the risk of having dangerously low blood pressure if hypotensive herbs are taken and this may compound the effect. My mother and I have tried this and it really has helped with our memories. In additon, because it increases acetylcholine, it reduced my heartburn considerably (a connection I recently learned of)! We are fans.